Not sure how many daffodils you need to qualify for “a host”, but what few we’ve got are at their best in the garden right now. They seem to be a lot later than everyone else’s in Malvern, the neighbours daffodils were blooming marvellous about 6 weeks ago; but better late than never. Yellow is definitely this season’s colour at the moment. 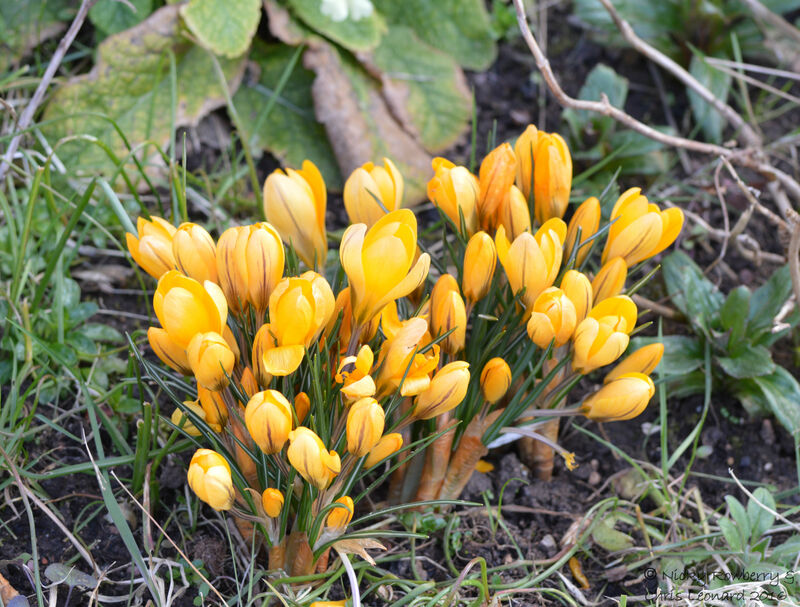 Some is of course down to me choosing yellow, such as these crocuses, to brighten up the cold days. 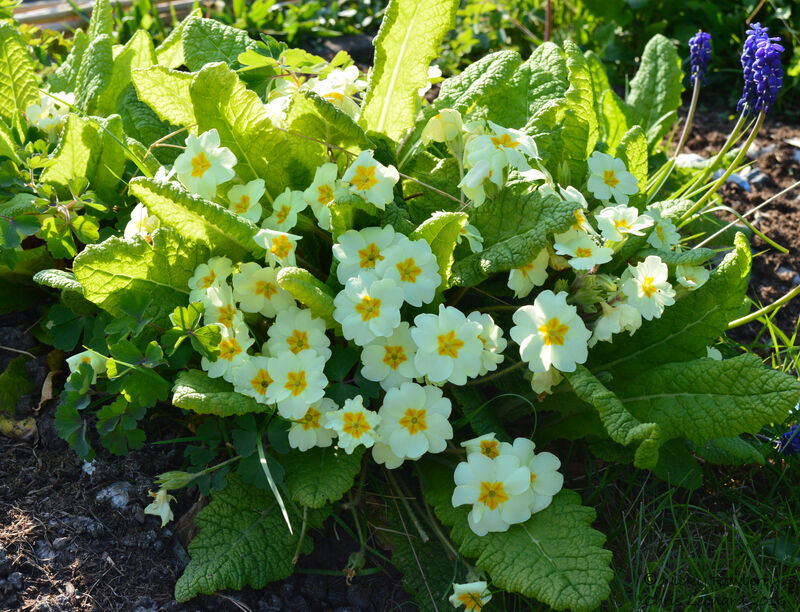 But a lot of it is due to the more natural, self seeding “weeds” such as the primroses and dandelions that proliferate in our garden. All these spring flowers are good news for the insects, which are now starting to arrive in the garden in moderate numbers. The yellowyness of Spring continued with the first butterfly in the garden – a Brimstone. 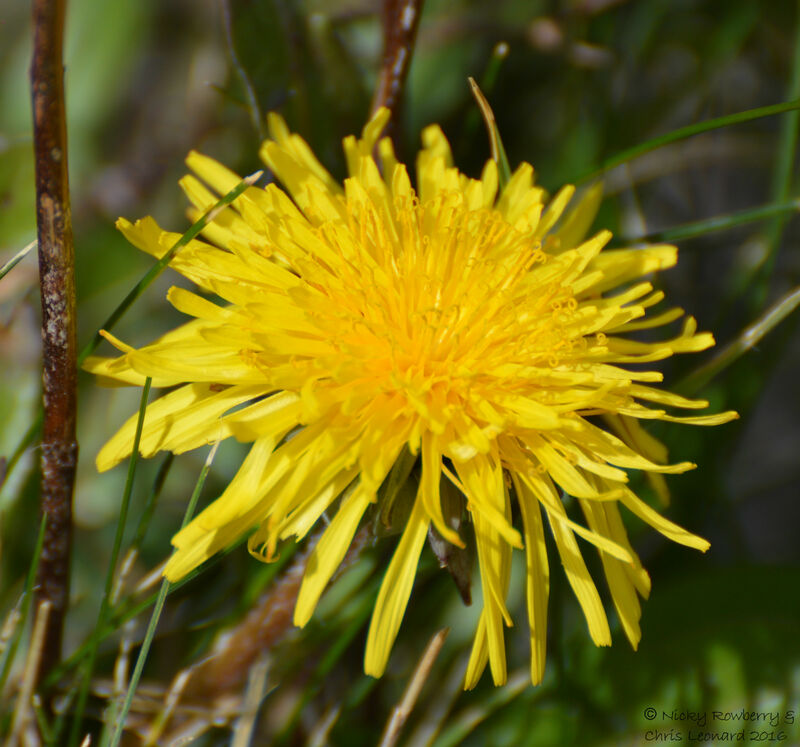 In typical Brimstone fashion it was too fast to get a photo, but we think it was a male as it was bright yellow – the original “butter coloured fly” or butterfly. Hopefully soon one will hang around long enough to get his photo taken. But the good news was that it meant I could log it onto the new online garden butterfly survey – http://www.gardenbutterflysurvey.org/ – my first record for the year. As well as the first butterflies and bees, the first wasp put in an appearance too. 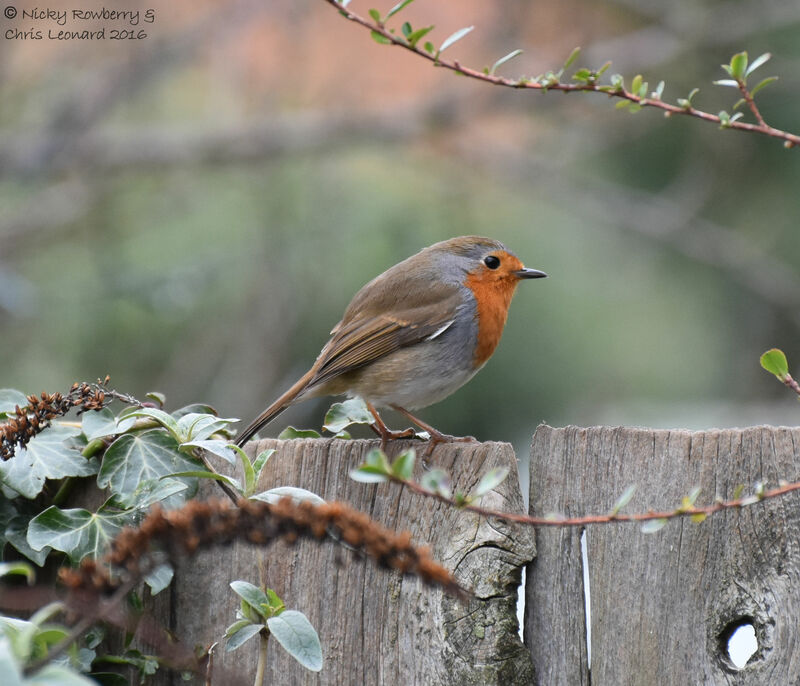 It was a bit dopey and hung about on the fence, warming itself in the spring sunshine for quite a while – good news for my photography attempts. 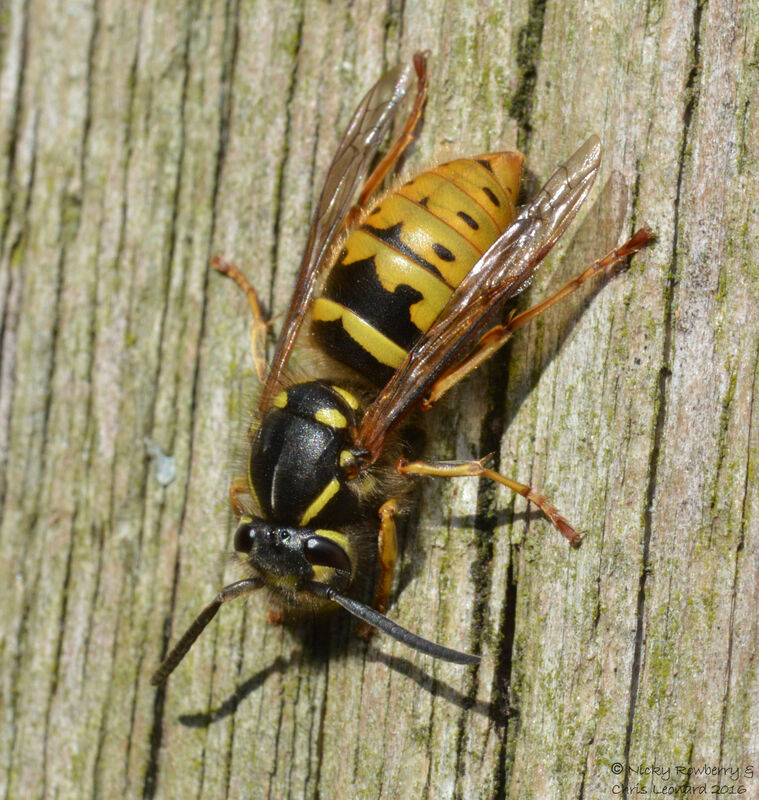 I know wasps aren’t everyone’s favourites, but close up they really are quite stunning! This last week of sunshine (and showers) has brought the bees out in our garden – at least three species already, plus a massive unidentified one going like a bumblebee out of hell over the roof! 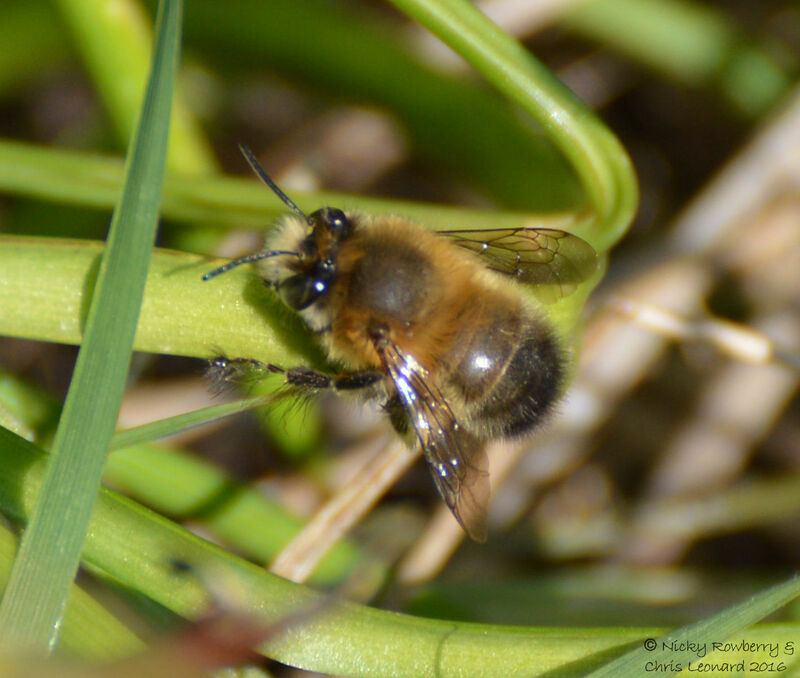 When it comes to identifying bees, it would seem a bee’s knees are hardly relevant at all. In the case of our first positively identified species this year, it was the feet that were key for the charmingly named Hairy Footed Flower Bee (Anthophora plumipes). This is one of the earliest bee species to appear in the spring and we had several merrily tucking into the primroses last weekend. 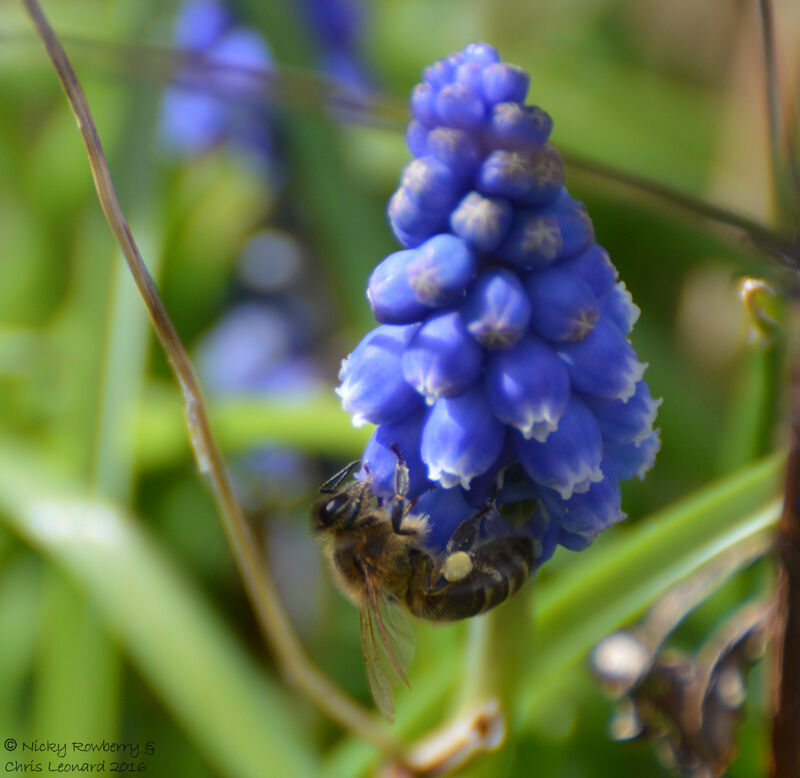 The second species to be spotted in the Lazy Garden was this little mining bee (Andrena sp.) seen basking on an ivy leaf in the sunshine. Unfortunately there are lots of species of mining bees and my photography wasn’t up to scratch enough to be able to identify this one. I did load it onto the ever-useful iSpot website, where several very helpful people discussed various possibilities (I would love to say “debate raged” over my bee, but that would be a bit over dramatic), before concluding that it was best to just stick with Andrena sp. rather than get it wrong. 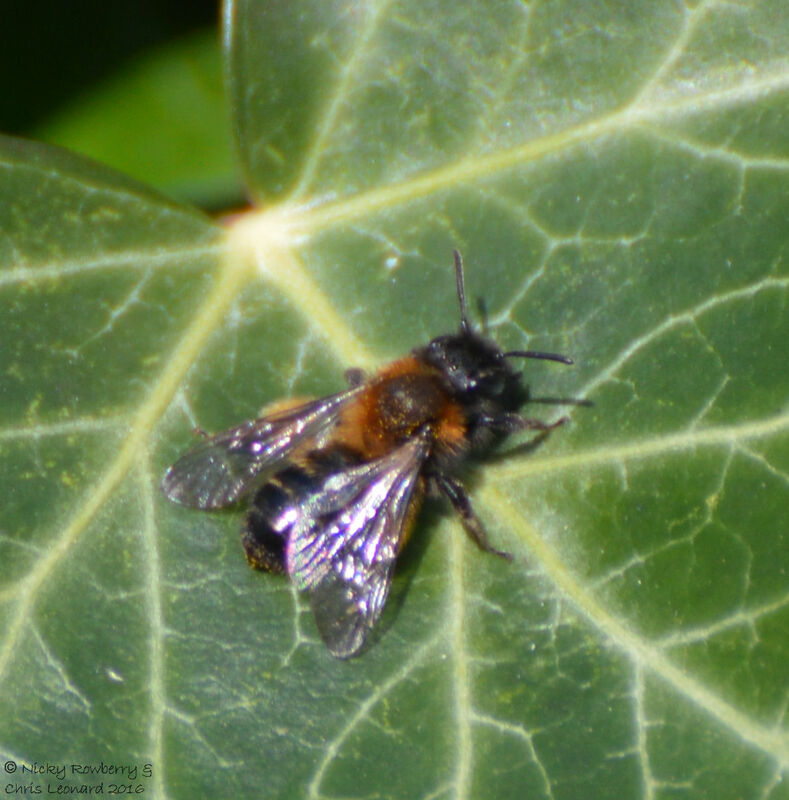 Hopefully our mining bee will reappear sometime when Chris (who can work the macro lens) is out in the garden and we can get a better photo to nail the identification. The final species this week was the humble, but oh so important, Honey Bee (Apis mellifera) seen here already sporting a fine set of pollen sacs. Bee populations in general are struggling so much at the moment, it was great to see 3 species at least surviving in our garden. And finally I’ve been having a go with the trail cam filming our bee friends. 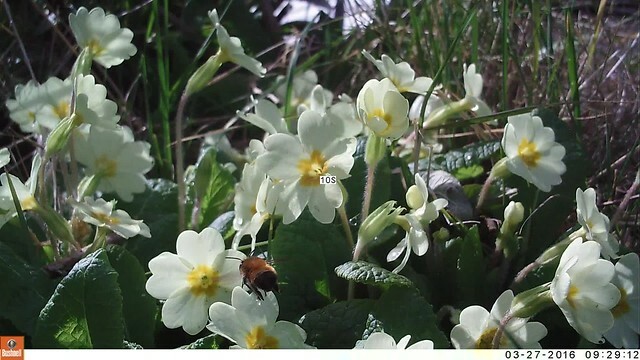 As per usual with the trail cam, I had to wade through quite a lot of footage of things blowing about in the wind (in this case mainly primroses) before finding this short film of our Hairy Footed Flower Bee, doing what he does best – landing on flowers with his hairy little feet! 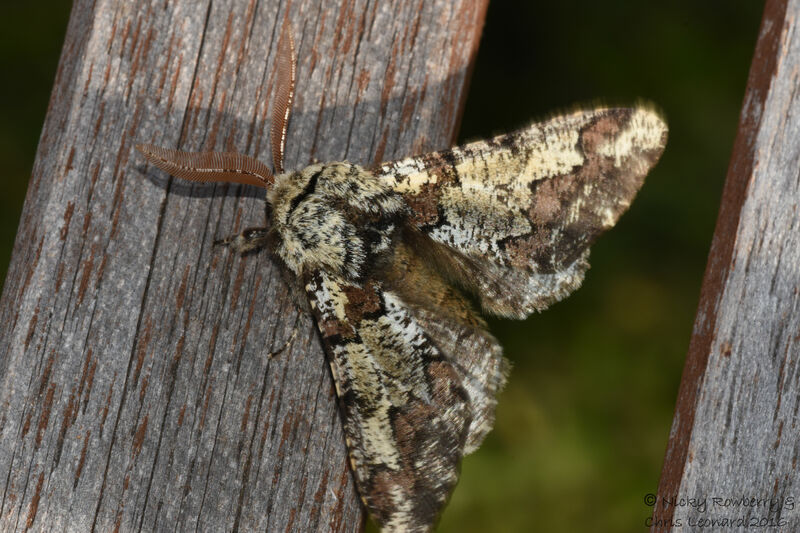 It was week two of the Garden Moth Scheme last weekend – I put the trap out twice – once for the official GMS count and once just because I probably need to get out more! Needless to say the non-GMS night produced more moths than the official night, but then it was several degrees warmer. 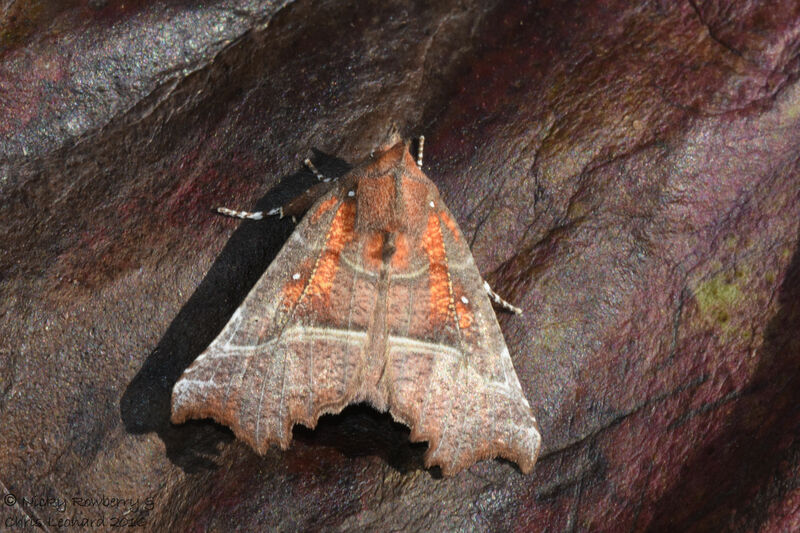 I was tempted to log the better of the two results, but decided to be a good citizen scientist – after all the aim of the scheme is to find out about moth numbers on average nights, not just on the best ones! 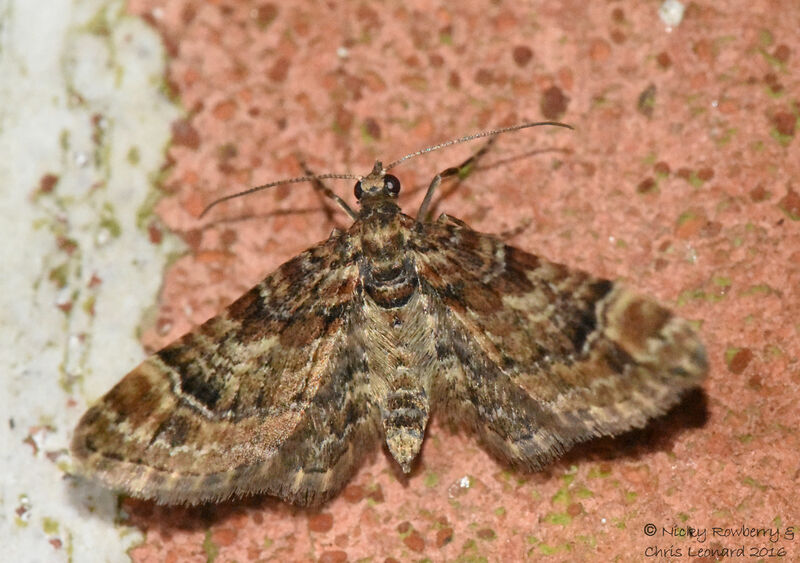 The official night still produced 6 moths of 4 species, including this small Double Striped Pug (Gymnoscelis rufifasciata), which landed on the garage wall next to the trap at the beginning of the night and stayed there until dawn. 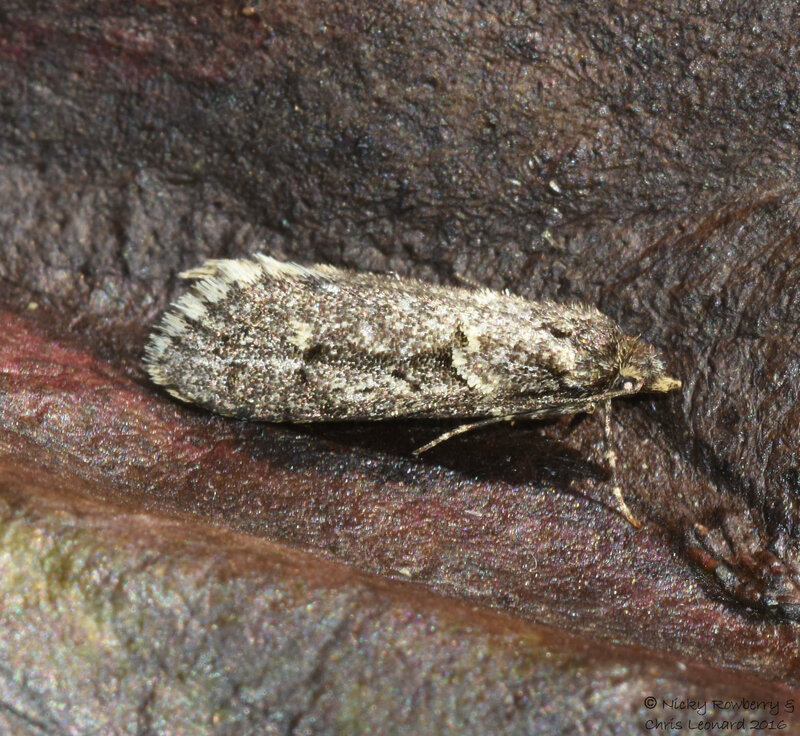 The trap also attracted a Common Plume (Emmelina monodactyla) – a funny stick like micro moth, shaped like a capital T, hence its other common name T-moth. The second trapping night produced 24 moths of 8 species, including this new species for our garden the March Tubic (Diurnea fagella). Another first for the garden was this much more attractive (apologies to the above March Tubic) Herald moth (Scoliopteryx libatrix). I’d been wanting to find one of these in the garden for a while (having previously only seen it when I’d rescued a few from a friend’s building site of a garage). Herald moths overwinter as adults, so this was probably one that had been hibernating somewhere nearby and emerged on one of the first warm nights. But the star of the show was this magnificent Oak Beauty (Biston strataria) – a large moth with fantastic feathered antennae. We have had them in the garden before, but this was a lovely fresh specimen, looking his or her best. Sadly this beauty was doomed. 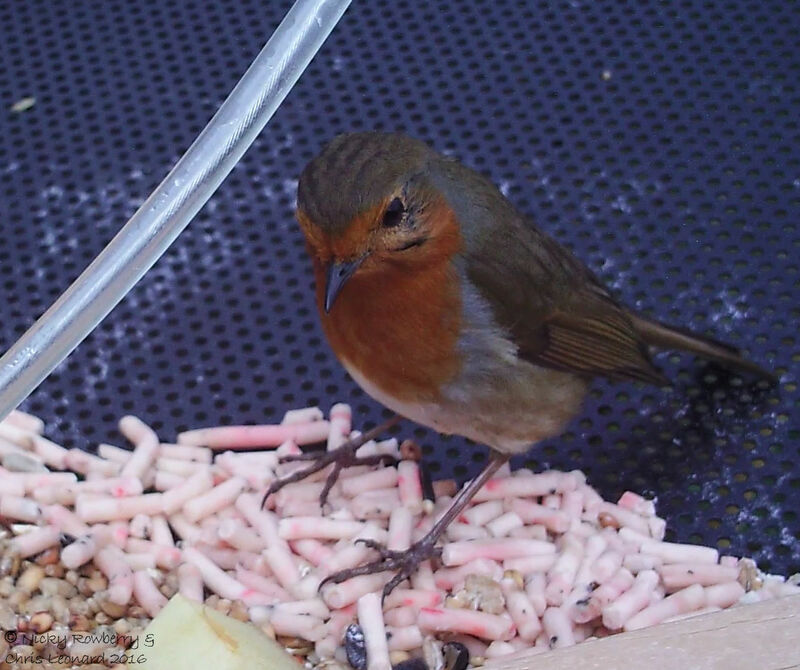 Before I could move him to the safety of a quiet corner, he took off, flapping towards the apple tree. Unfortunately hubby and I weren’t the only ones watching him go and before we knew it, a robin swooped down and had our bright beauty for breakfast. It must have made a big fat treat for the robin, but I must admit I felt more than a little guilty at our part in this poor moth’s short life! So the two nights trapping brings the total species count for the year to 12, which includes 4 new records for the garden – not a bad start to the year at all. Sadly the Oak Beauty can’t say the same! The wildlife interest in our garden seems to be swinging at the moment to and fro between the moth traps and the trail cam. Last weekend the trail cam definitely came out on top though, when it threw up a complete surprise in the garden. 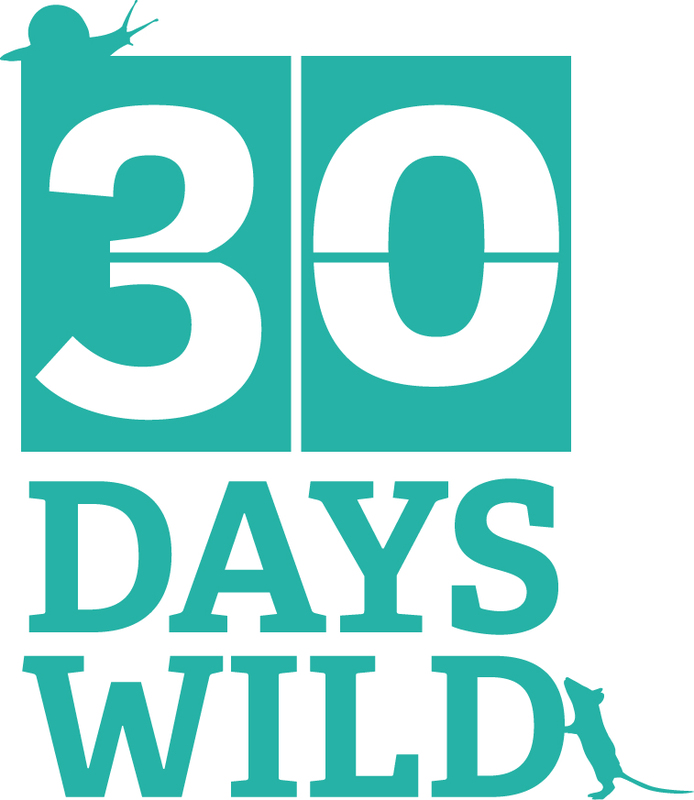 I guess many of us put out these cameras with the vague hope that they will reveal something unexpected and this weekend ours did. 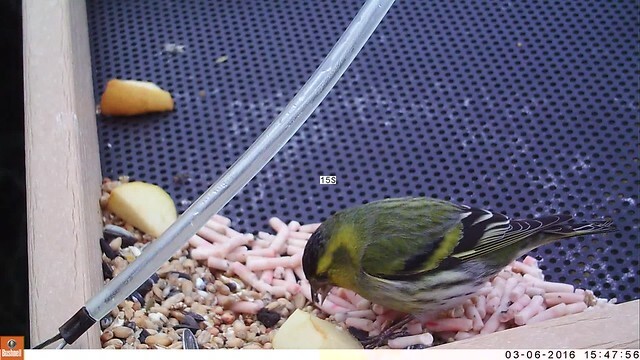 It may not have captured anything super rare, but it did film a Siskin – a bird which we didn’t even know we had in the garden. Of course it would have been nice to see the Siskin in the flesh rather than just on film, but at least we know now to look out for it! 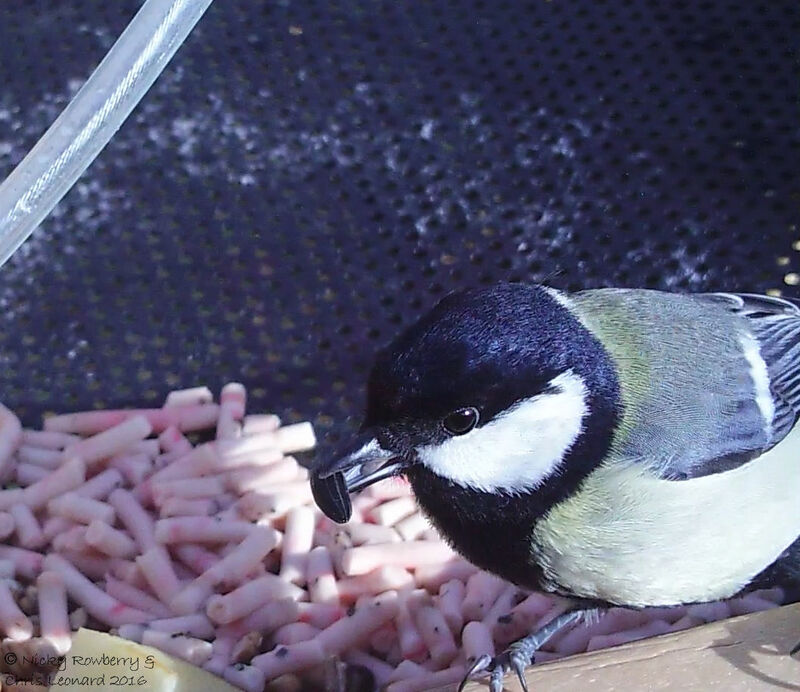 We’d hung this bird table out a week or so ago and were initially a bit annoyed that its design meant it immediately swivelled, tipping all the seeds into one corner. But this jaunty angle actually appears to be working to our advantage, as the slope (and general instability) seems to be deterring the pigeons and larger birds and allowing the smaller ones to get a look in. 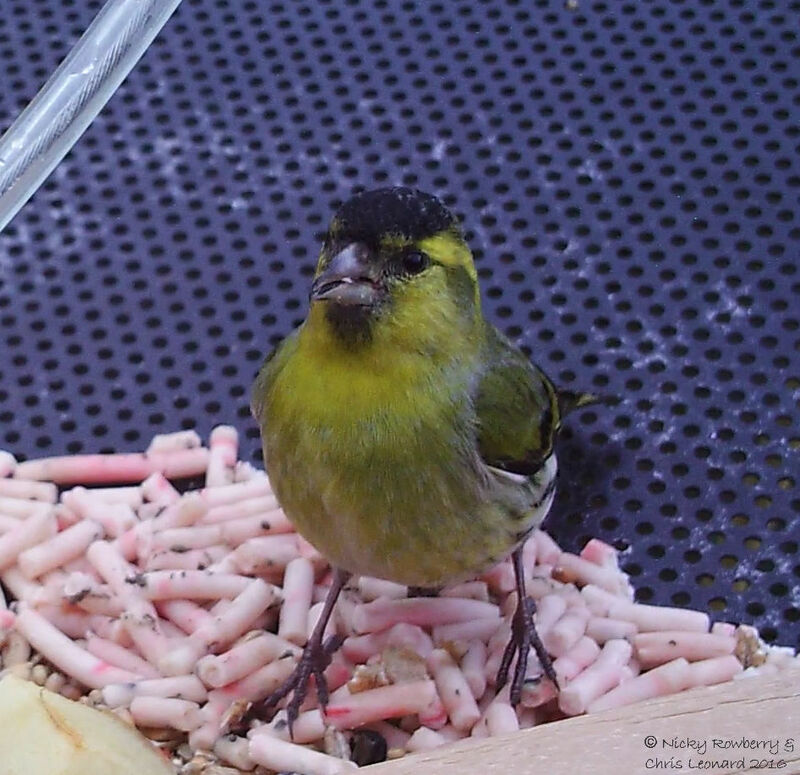 The Siskin is an attractive bird, so I tried to get some correspondingly attractive still images from the film. 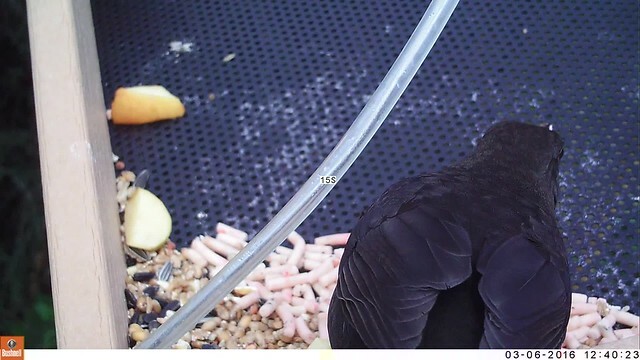 Unfortunately it was so intent on scoffing the sunflower seeds, that it was difficult to get an image without food hanging from its mouth, so these were the best I could do. 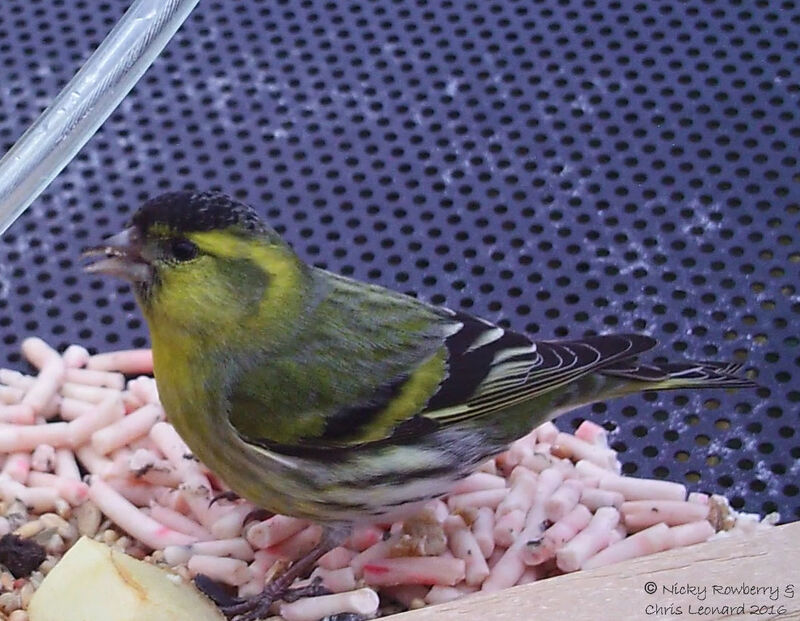 The sloping feeder attracted several other species that afternoon, although none stayed as long, or were quite so fond of their food, as the Siskin – a bird after my own heart! Is it a moth, is it a fly? I had hoped this weekend to be posting results from my first official moth trapping night for the Garden Moth Scheme. Unfortunately I got a complete no-show; not a single moth deigned to put in an appearance. All I got to record was the minimum temperature (-1.9°C)! I’m trying to console myself with the thought that there is no such thing as bad data – even a nil count provides information, even if it’s not very exciting information. So in the absence of any moths, I’m posting about the next best thing – a Moth Fly. This little beauty (and it is little – only a couple of millimetres wide) appeared this week on a garden planter next to a bucket of water. 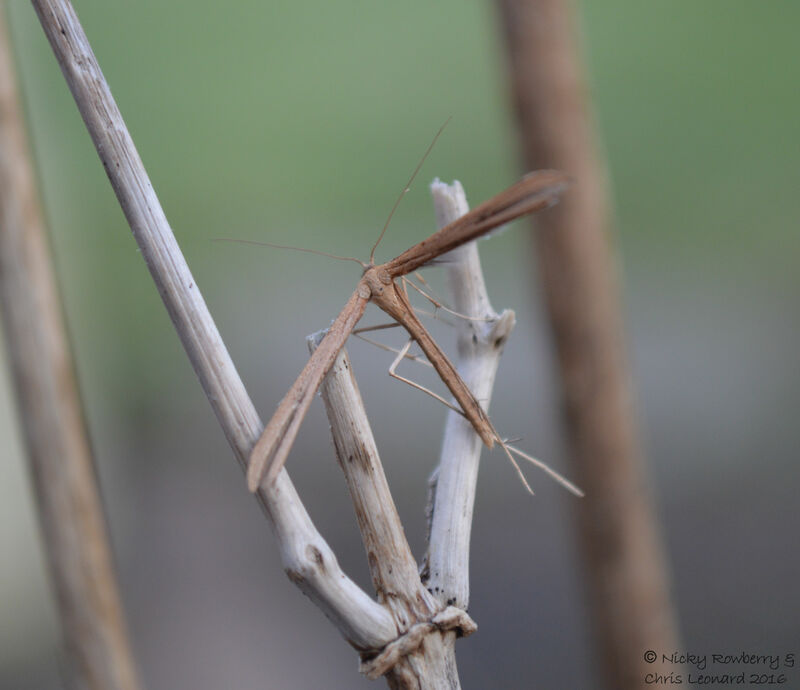 They may look like tiny moths, but they are actually a type of fly – hence the common name Moth Fly. 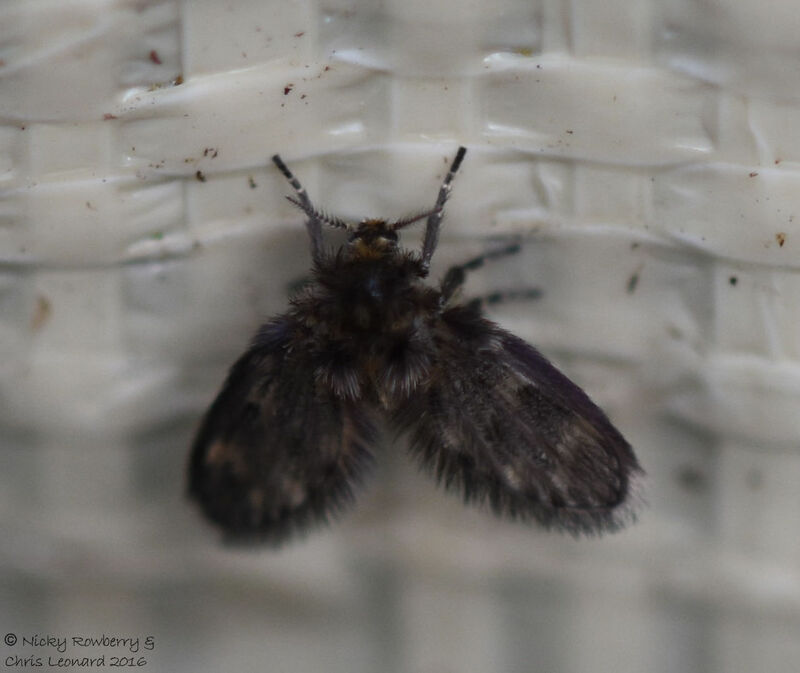 They are also known by the less than romantic pseudonym of Drain Fly, as their larvae are found in drains or stagnant water. A slightly more appealing alias is Owl Midge. Their wings and bodies are characteristically hairy giving them their moth-like appearance. I’ve no idea of the species (there are about 100 species in the UK); I suspect a microscope would be needed to identify it to that level. If anyone’s got any suggestions though, they would be most gratefully received. Fingers crossed next weekend brings some warmer weather and some genuine moths in the trap. I’ve been so absorbed with my new trail cam for the last few weeks, I’d almost forgotten that we have other “normal” cameras! Having dug the Nikon out though to take photos of the moths (see previous post), I had a rummage round the garden to see what else was about. The two animals that caught my eye both happened to bring a burst of colour on an otherwise grey day. 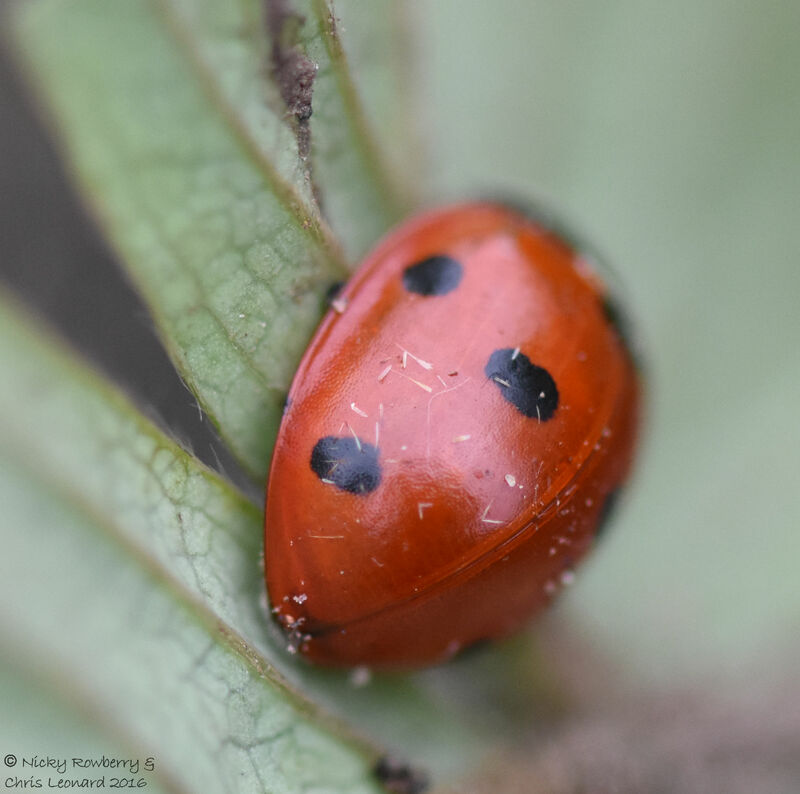 One was my first ladybird of the year – a Seven Spot Ladybird to be precise. I disturbed it while weeding (yes I actually did a bit of weeding, more on that in another post soon). I had to enlist the help of hubby Chris to take these photos as he has mastered the macro lens, whereas I am still an auto mode kind of girl! The seven spot ladybirds are apparently the most common ladybirds in Europe. 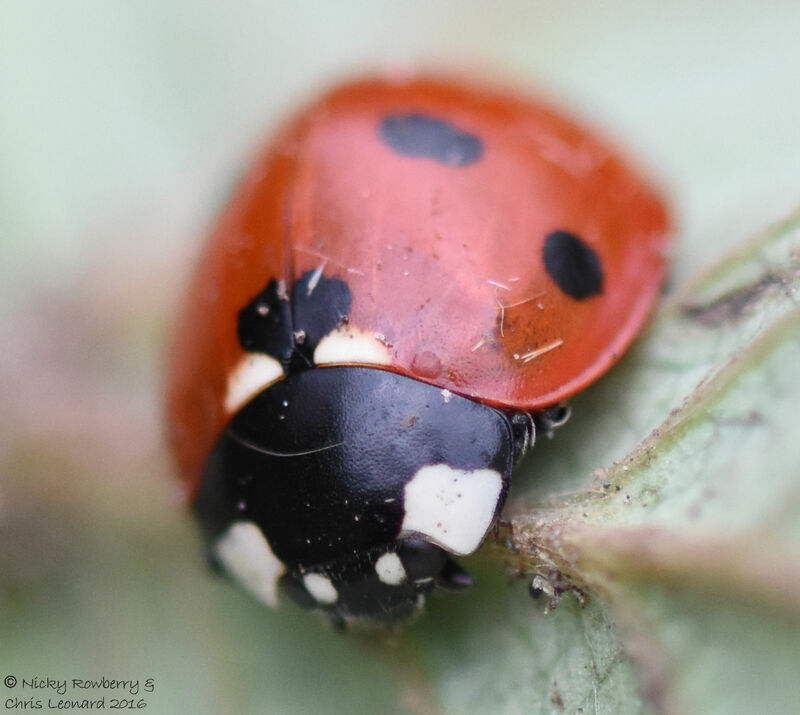 Having said that, in the summer, we seem to get just as many of the invasive Harlequin Ladybird, so it was a delight that the seven spot that had made it through the winter. We returned him to the pile of weeds once his photo shoot was over, so hopefully he’ll make it through to the spring. 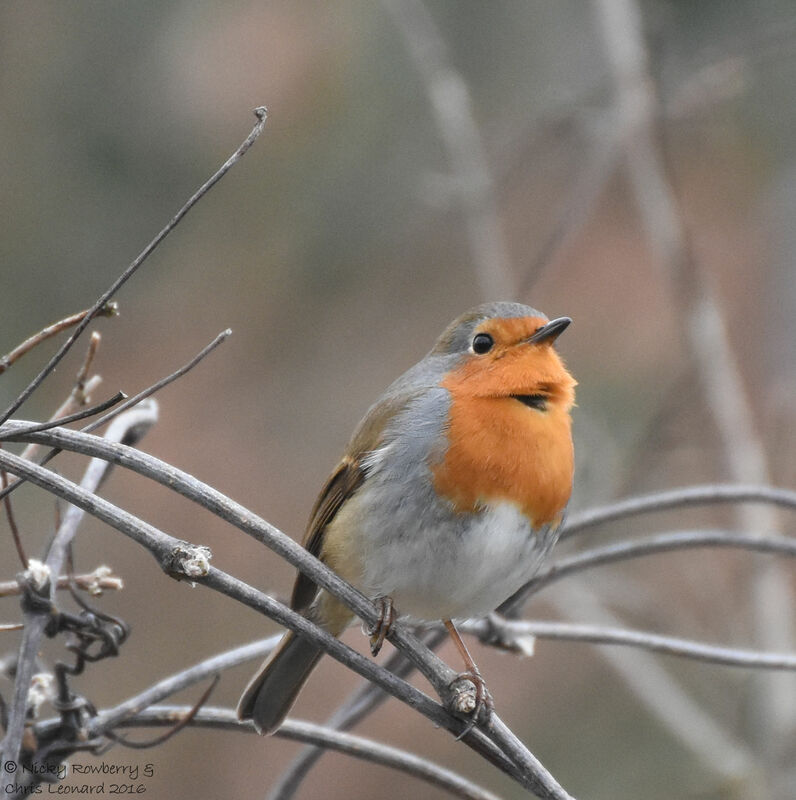 The second splash of colour in the garden was a pair of robins, chirruping away as they watched me fiddling with the moth trap. One in particular seemed disposed to pose for the camera, probably hoping I’d leave a few moths out as payment! 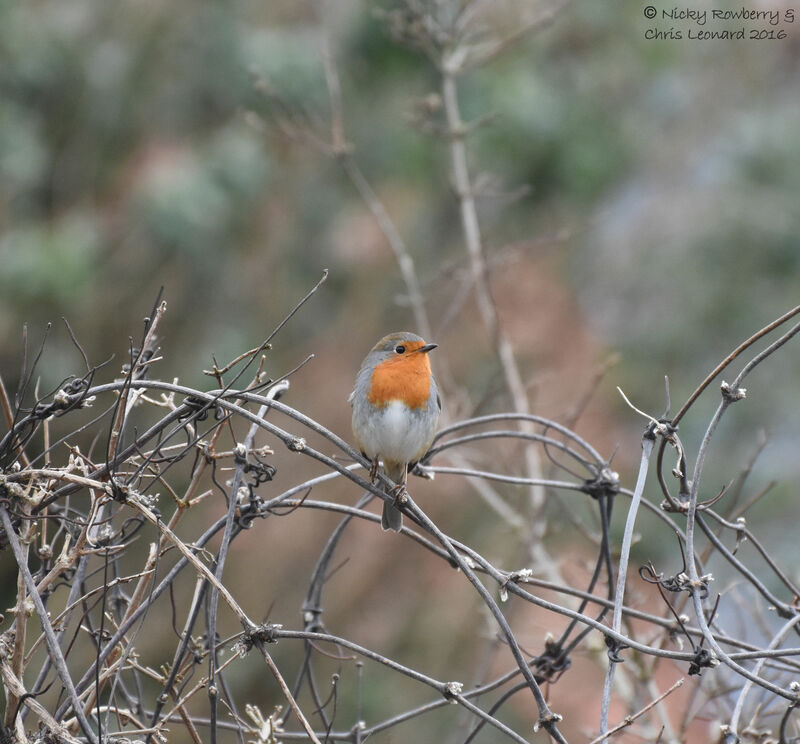 It’s pouring with rain and blowing a gale here in Malvern today, but these cheery little characters bring hope that spring is on its way at last!